Cronos Group Inc. (CRON) is confirmed to report earnings at approximately 7:00 AM ET on Tuesday, March 26, 2019. The consensus estimate is for a loss of $0.01 per share on revenue of $6.70 million and the Earnings Whisper ® number is ($0.01) per share. Investor sentiment going into the company's earnings release has 49% expecting an earnings beat. Consensus estimates are for earnings to decline year-over-year by 200.00% with revenue increasing by 428.39%. Short interest has decreased by 29.5% since the company's last earnings release while the stock has drifted higher by 148.1% from its open following the earnings release to be 66.6% above its 200 day moving average of $11.55. Overall earnings estimates have been revised lower since the company's last earnings release. On Thursday, March 7, 2019 there was some notable buying of 4,621 contracts of the $22.00 put expiring on Thursday, April 18, 2019. Option traders are pricing in a 11.3% move on earnings and the stock has averaged a 2.7% move in recent quarters. 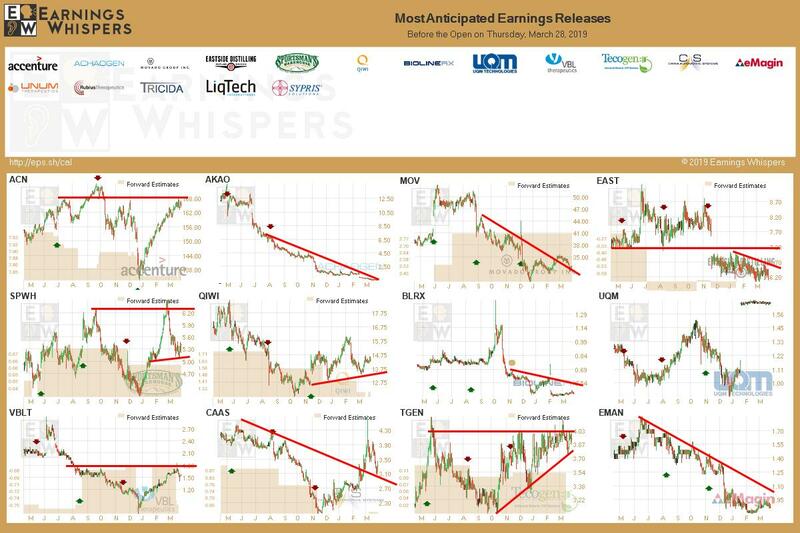 New Age Beverages Corporation (NBEV) is confirmed to report earnings before the market opens on Friday, March 29, 2019. Investor sentiment going into the company's earnings release has 61% expecting an earnings beat. Short interest has increased by 50.7% since the company's last earnings release while the stock has drifted higher by 62.3% from its open following the earnings release to be 18.5% above its 200 day moving average of $4.29. Overall earnings estimates have been revised higher since the company's last earnings release. 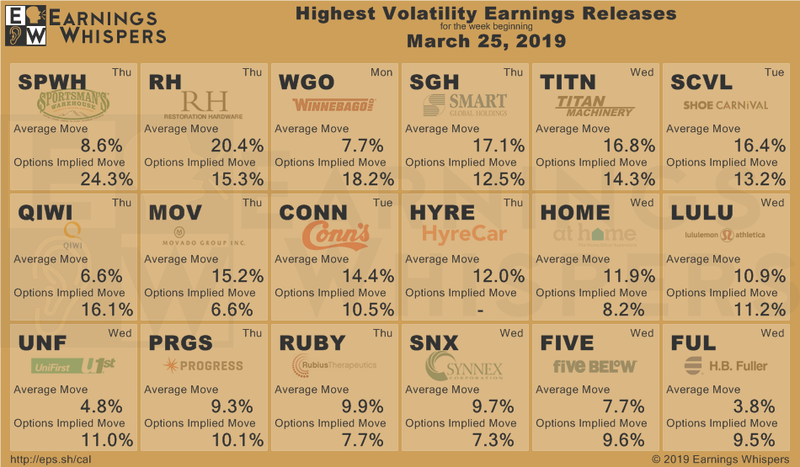 On Friday, March 22, 2019 there was some notable buying of 2,559 contracts of the $5.50 call expiring on Friday, March 29, 2019. Option traders are pricing in a 11.3% move on earnings and the stock has averaged a 5.5% move in recent quarters. 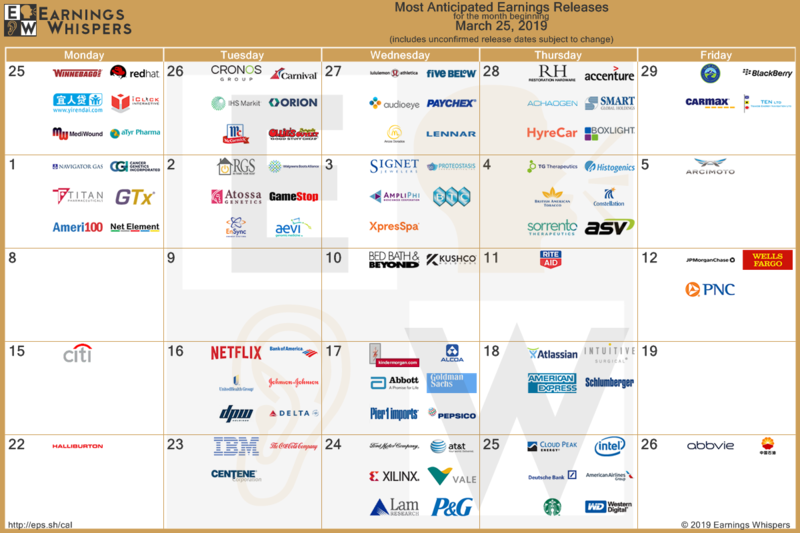 lululemon athletica inc. (LULU) is confirmed to report earnings at approximately 4:05 PM ET on Wednesday, March 27, 2019. The consensus earnings estimate is $1.74 per share on revenue of $1.15 billion and the Earnings Whisper ® number is $1.78 per share. Investor sentiment going into the company's earnings release has 83% expecting an earnings beat The company's guidance was for earnings of $1.64 to $1.67 per share. Consensus estimates are for year-over-year earnings growth of 30.83% with revenue increasing by 23.82%. Short interest has decreased by 33.3% since the company's last earnings release while the stock has drifted higher by 8.5% from its open following the earnings release to be 4.5% above its 200 day moving average of $137.09. Overall earnings estimates have been revised higher since the company's last earnings release. 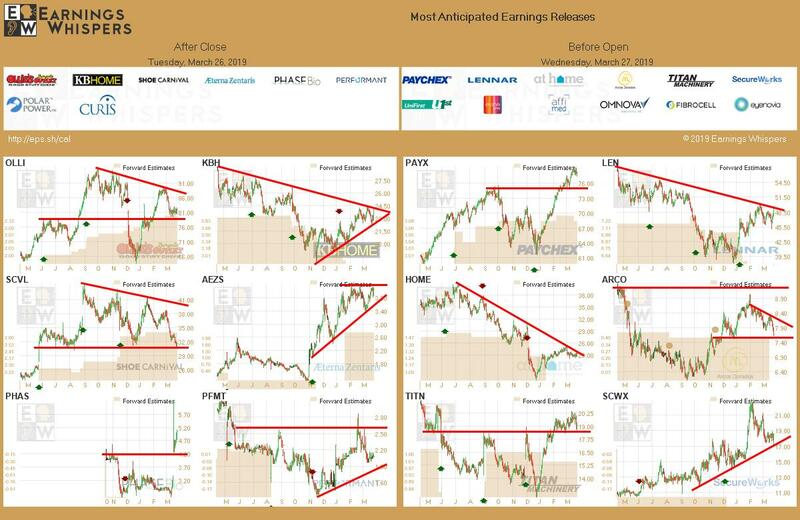 On Friday, March 22, 2019 there was some notable buying of 1,159 contracts of the $143.00 call expiring on Friday, March 29, 2019. Option traders are pricing in a 11.2% move on earnings and the stock has averaged a 10.9% move in recent quarters. BlackBerry Limited (BB) is confirmed to report earnings at approximately 7:00 AM ET on Friday, March 29, 2019. The consensus earnings estimate is $0.06 per share on revenue of $227.14 million and the Earnings Whisper ® number is $0.08 per share. Investor sentiment going into the company's earnings release has 72% expecting an earnings beat. Consensus estimates are for year-over-year earnings growth of 0.00% with revenue decreasing by 2.52%. Short interest has decreased by 23.0% since the company's last earnings release while the stock has drifted higher by 20.4% from its open following the earnings release to be 7.6% below its 200 day moving average of $9.76. On Thursday, March 14, 2019 there was some notable buying of 3,518 contracts of the $10.00 call expiring on Friday, May 17, 2019. Option traders are pricing in a 9.4% move on earnings and the stock has averaged a 7.3% move in recent quarters. Five Below, Inc. (FIVE) is confirmed to report earnings at approximately 4:00 PM ET on Wednesday, March 27, 2019. The consensus earnings estimate is $1.57 per share on revenue of $601.72 million and the Earnings Whisper ® number is $1.59 per share. Investor sentiment going into the company's earnings release has 81% expecting an earnings beat The company's guidance was for earnings of $1.53 to $1.57 per share on revenue of $593.00 million to $600.00 million. Consensus estimates are for year-over-year earnings growth of 33.05% with revenue increasing by 19.19%. Short interest has decreased by 14.5% since the company's last earnings release while the stock has drifted higher by 11.0% from its open following the earnings release to be 4.4% above its 200 day moving average of $112.07. Overall earnings estimates have been revised higher since the company's last earnings release. On Tuesday, February 26, 2019 there was some notable buying of 1,023 contracts of the $90.00 put expiring on Thursday, April 18, 2019. Option traders are pricing in a 9.6% move on earnings and the stock has averaged a 7.7% move in recent quarters. 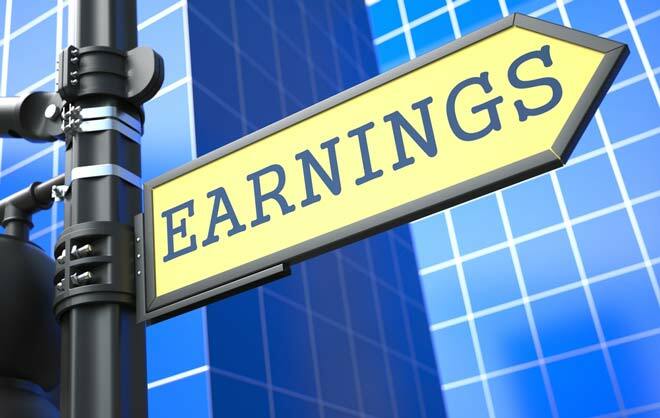 Winnebago Industries, Inc. (WGO) is confirmed to report earnings at approximately 7:00 AM ET on Monday, March 25, 2019. The consensus earnings estimate is $0.56 per share on revenue of $425.57 million and the Earnings Whisper ® number is $0.59 per share. Investor sentiment going into the company's earnings release has 53% expecting an earnings beat. Consensus estimates are for earnings to decline year-over-year by 9.68% with revenue decreasing by 9.14%. Short interest has increased by 83.0% since the company's last earnings release while the stock has drifted higher by 32.7% from its open following the earnings release to be 10.6% below its 200 day moving average of $32.54. Overall earnings estimates have been revised higher since the company's last earnings release. On Monday, March 18, 2019 there was some notable buying of 995 contracts of the $35.00 call expiring on Thursday, April 18, 2019. Option traders are pricing in a 18.2% move on earnings and the stock has averaged a 7.7% move in recent quarters. 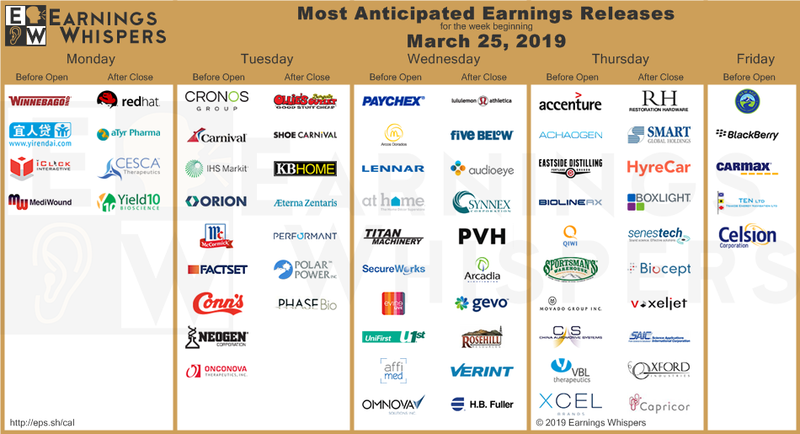 RH (RH) is confirmed to report earnings at approximately 4:05 PM ET on Thursday, March 28, 2019. The consensus earnings estimate is $2.87 per share on revenue of $686.70 million and the Earnings Whisper ® number is $3.00 per share. Investor sentiment going into the company's earnings release has 80% expecting an earnings beat The company's guidance was for earnings of $2.75 to $2.90 per share on revenue of $680.00 million to $690.00 million. Consensus estimates are for year-over-year earnings growth of 69.82% with revenue increasing by 2.45%. Short interest has decreased by 8.6% since the company's last earnings release while the stock has drifted lower by 9.9% from its open following the earnings release to be 1.1% below its 200 day moving average of $132.54. Overall earnings estimates have been revised higher since the company's last earnings release. On Wednesday, March 20, 2019 there was some notable buying of 954 contracts of the $115.00 put expiring on Friday, April 5, 2019. Option traders are pricing in a 15.3% move on earnings and the stock has averaged a 20.4% move in recent quarters. 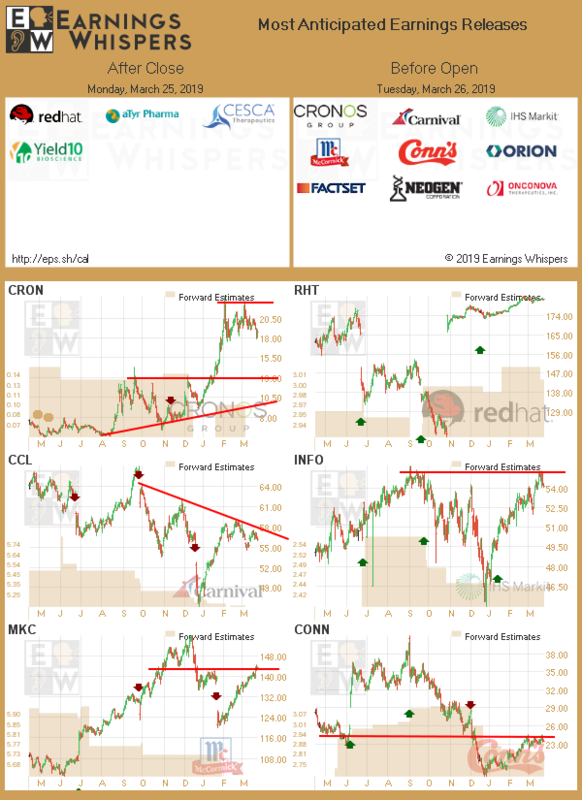 Red Hat, Inc. (RHT) is confirmed to report earnings at approximately 4:20 PM ET on Monday, March 25, 2019. The consensus earnings estimate is $1.01 per share on revenue of $887.13 million. Investor sentiment going into the company's earnings release has 57% expecting an earnings beat. Consensus estimates are for year-over-year earnings growth of 6.32% with revenue increasing by 14.86%. Short interest has increased by 23.9% since the company's last earnings release while the stock has drifted higher by 3.1% from its open following the earnings release to be 14.2% above its 200 day moving average of $159.14. Overall earnings estimates have been revised higher since the company's last earnings release. On Monday, March 4, 2019 there was some notable buying of 3,000 contracts of the $170.00 put expiring on Friday, January 17, 2020. Option traders are pricing in a 2.2% move on earnings and the stock has averaged a 5.2% move in recent quarters. 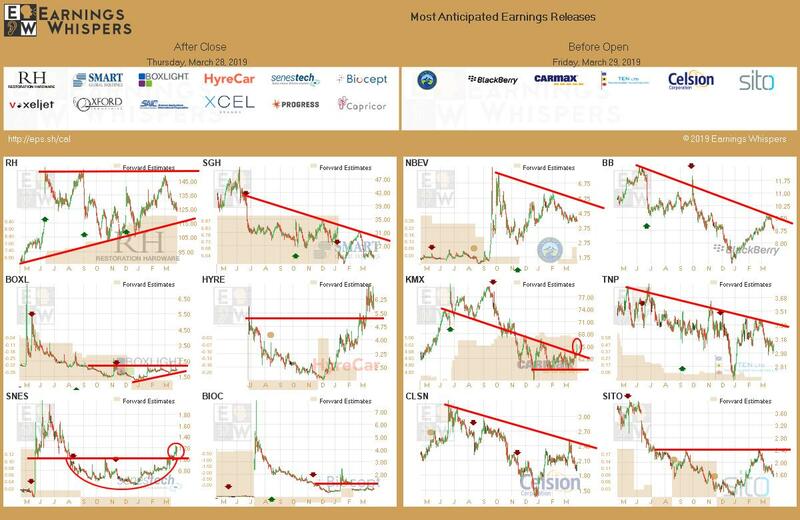 AudioEye, Inc. (AEYE) is confirmed to report earnings after the market closes on Wednesday, March 27, 2019. The consensus estimate is for a loss of $0.18 per share on revenue of $1.65 million. Investor sentiment going into the company's earnings release has 60% expecting an earnings beat. Consensus estimates are for earnings to decline year-over-year by 800.00% with revenue increasing by 88.36%. The stock has drifted higher by 68.7% from its open following the earnings release. Overall earnings estimates have been revised higher since the company's last earnings release. 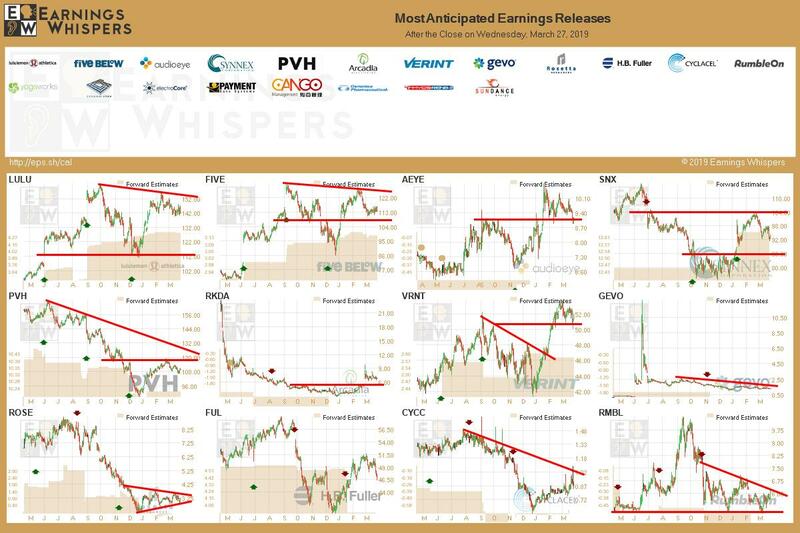 Paychex, Inc. (PAYX) is confirmed to report earnings at approximately 8:30 AM ET on Wednesday, March 27, 2019. The consensus earnings estimate is $0.89 per share on revenue of $1.03 billion and the Earnings Whisper ® number is $0.91 per share. Investor sentiment going into the company's earnings release has 55% expecting an earnings beat. Consensus estimates are for year-over-year earnings growth of 41.27% with revenue increasing by 18.87%. Short interest has increased by 15.4% since the company's last earnings release while the stock has drifted higher by 21.1% from its open following the earnings release to be 10.5% above its 200 day moving average of $71.01. Overall earnings estimates have been revised higher since the company's last earnings release. On Tuesday, March 12, 2019 there was some notable buying of 3,581 contracts of the $62.50 put expiring on Friday, September 20, 2019. Option traders are pricing in a 3.7% move on earnings and the stock has averaged a 1.7% move in recent quarters.